While a menstrual period seems to be hard enough, dealing with hormonal imbalances and other side effects seem to be harder for most women. A period may be accompanied by a throbbing or cramping pain in the lower abdomen that can make you uncomfortable, uneasy and disinterested in work. The pain experienced around the stomach and pelvic area by women during their menstruation is called a menstrual cramp. If there is no sperm to fertilize the egg during a menstrual cycle, the uterus contracts to expel its lining. For this purpose, a hormone like substance called prostaglandin is released. This is associated with pain and inflammation. These uterine contractions inhibit blood flow to the uterine lining and hence a high level of pain is experienced. About 50% of women experience menstrual cramps. Women who do not exercise regularly report to have experienced severe menstrual cramps. Other factors such as age and emotional stress also play an important role. Symptoms of menstrual cramps can vary from dull, throbbing pain in the lower abdomen to dizziness, nausea and vomiting, loose stools, sweating and bloating of the abdomen. • Stick to a well balanced diet including adequate amount of cereals, pulses, milk and milk products, fresh fruits, vegetables and foods rich in fibre. • Soaking in a hot bath or using a heating pad on your abdomen is effective. • Vitamin E, omega-3 fatty acids, vitamin B1 (thiamine), vitamin B-6 and magnesium supplements may effectively reduce menstrual cramps. • A cup of ginger, honey and lemon tea relieves pain. • Studies have found that physical activity may ease the pain of menstrual cramps. • Including cinnamon, sesame seeds, basil and parsley in the diet is advantageous. • Eating citrus fruits and other food rich in vitamin C helps in the better absorption of iron as there is loss of iron in the body. • Drinking a glass of the juice of carrot, beetroot and cucumber along with parsley can also help to ease the discomfort. Menstrual cramps are a part of the cycle that many women can't get away from. 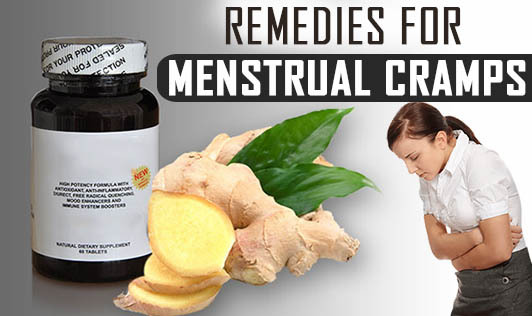 Try these simple remedies to ease the pain and reduce the severity of these cramps.